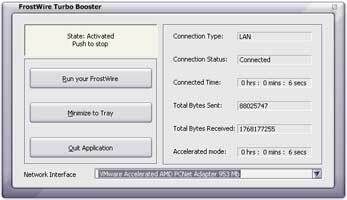 FrostWire Turbo Booster is a dedicated utility developed as a support for FrostWire, a P2P client that has rapidly come to be one of the most appreciated in the file sharing world and which makes use of the popular LimeWire P2P network. The addition of FrostWire Turbo Booster to your existing FrostWire client will make searching, sharing and downloading more accurate and quicker. And the offerings go on: fully downloaded and much more. ...... connection settings to deliver that downloading performance you've been waiting for so long. There are also extra features to bring ease to your sharing of files: it automatically resumes interrupted downloads, automatically makes checksum verification to prevent corrupted downloads. And the offerings go on: fully downloaded and corrupt files are removed automatically; enables multiple searches by locating more sources at user-specified intervals; configuration from last run is saved and auto loads on start-up; all features are mediated through a smart easy-to- operate interface; interface can be managed through a system tray icon; displays info about status, duration of acceleration, profile, the number of bytes sent and received. Qweas is providing links to FrostWire Turbo Booster 4.0.2 as a courtesy, and makes no representations regarding FrostWire Turbo Booster or any other applications or any information related thereto. Any questions, complaints or claims regarding this application FrostWire Turbo Booster 4.0.2 must be directed to the appropriate software vendor. You may click the publisher link of FrostWire Turbo Booster on the top of this page to get more details about the vendor.